This steamed chicken is one of my favourites since I was a kid. Not sure what this is called in chinese but I do know this is cantonese style and recipe of my mum. 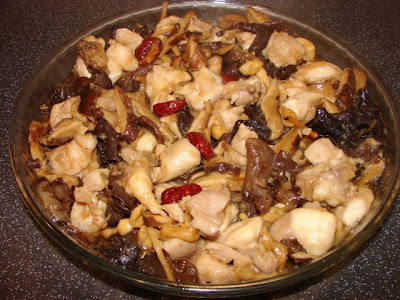 Various dried chinese vegetables are used such as shitake mushrooms, cloud ears, lily buds and red dates. All these dried vegetables are available from any chinese supermarket. To prepare the dried vegetables, soak till soften. Cut shitake into strips. For the lily bud remove any hard part and tie into each into knot if you got time. Clean the cloudears or woodear to remove any grits, then cut or tear into small pieces. For the red dates, cut into small slivers, remove stone if there is any. 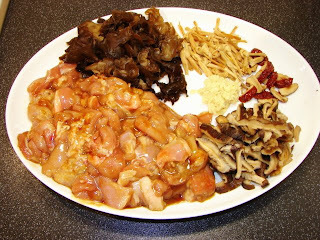 Mix chicken with the marinate and leave for about 20 minutes. Mix the soaked vegetables with chicken, put this onto a pyrex or deep dish and steam for about 25 - 30 minutes. Having made this after you told me about it on the BBC forum years back I can vouch for this. Very tasty.